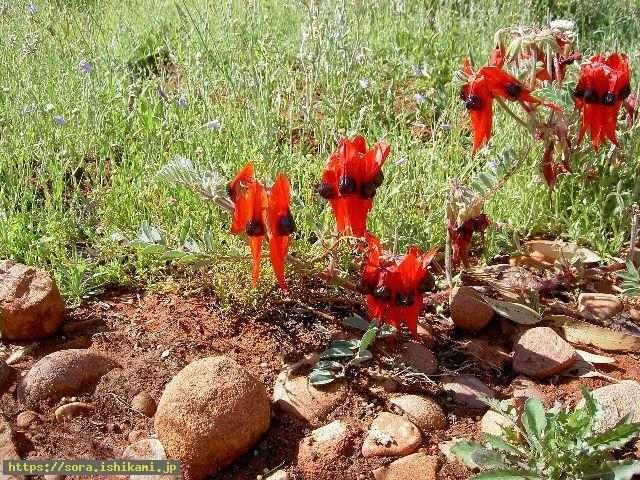 There were the flowers in Desert Park in Alice Springs. I thought I was hardly able to see this flower but channeling had told me I would be able to see this flower if I went there. I found they were really blooming there. It was the queen of Sirius that told a part of the earth to pop out and become the moon. I was told this flower showed it. The queen of Sirius didn't make the moon with the spiteful intention but she called out to make the moon in the separated place to help the earth, I was told. The ebb and flood actually seems to help the delivery. The wild red and white true parrot came flying before my eyes when I entered the park after a while, it perched on the branch and flew away after a while. Stone god here told me through the channeling he made the bird go and say hello to me.